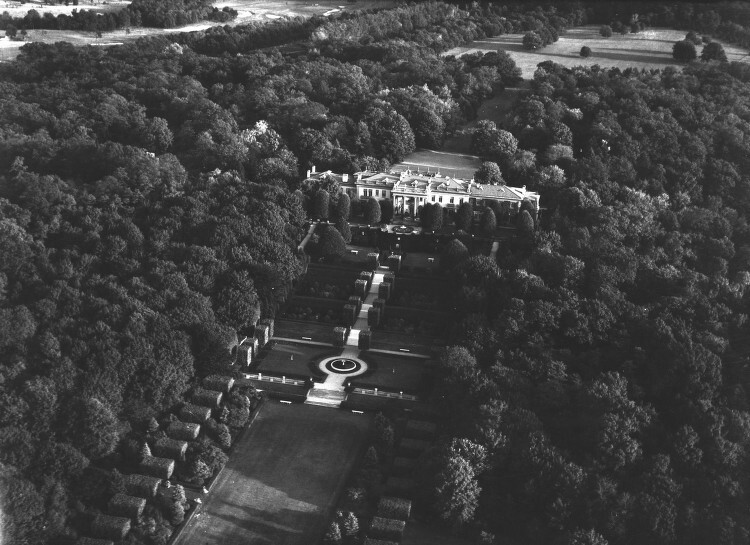 'Meudon', the William D. Guthrie estate designed by C.P.H. Gilbert c. 1900 in Lattingtown. Click HERE and HERE for more on 'Meudon'. This aerial is part of SMU's Robert Yarnall Richie collection and was taken between 1932-1934. It appears as if the gardens have been somewhat simplified from the views shown in Zach's post of 7-6-2009. I don't know why, but that long garden axis, perfect in theory, doesn't seem to work so well here. All of those topiaries and that myriad of plant material makes what should have been majestic appear fussy and over-contrived. By the way, the 1940 census is now available on-line. It's interesting to see how many of the great Long Island estates were still going "full tilt" or some semblance of full tilt right up to the eve of the 2nd World War. Even Meudon, which I had been told had begun to decline in the mid 1930's, had a fairly impressive roster of servants. I've always understood that Guthrie and Aldred bought Lattingtown village and erected their estates---but Meudon pre-dates Ormston by quite a few years. Any enlightenment? DED: I have also wondered the same thing- especially because the Aldred and Guthrie properties are not exactly contiguous- Peacock Point, the Davisson property and the George Baker property separate Meudon from Ormston at least on the northern boundry . My guess is that Guthrie bought and built first, and then continued to buy, eventually in conjunction with Aldred. Just a guess though. Magnus - census online? Link info?